Review of migraine starts with background information and IHS classification of migraine. Diagnostic criteria is mentioned to help the clinician reach a working diagnosis. Assessment of migraine includes advising patients to maintain a headache diary which can also help identify trigger.Under the heading suspecting serious cause of a headache, the GP can r/o presentations with red flags. 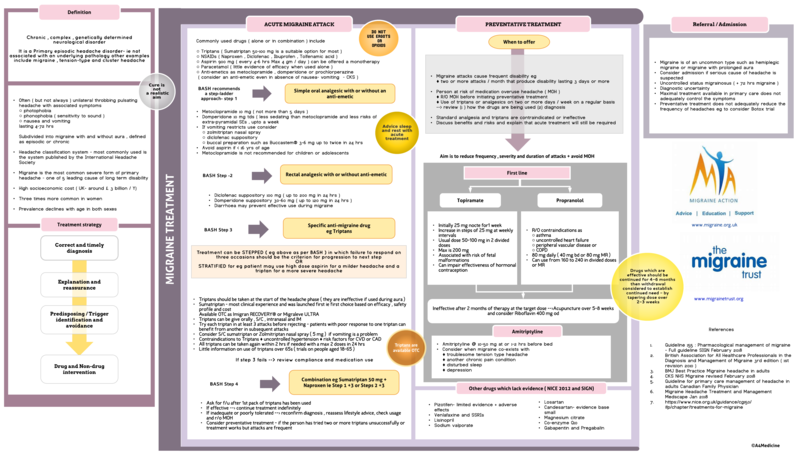 Differential diagnosis of a migraine headache and investigations are also included in this flowchart. Referral criteria are mentioned and this chart helps the GP in making a working diagnosis of migraine , r/o red flags consider other causes and possibly review the patient with a headache diary. The management of migraine would be addressed in a separate chart.